The team gathered in Ulaanbaatar, a modern sprawling city of contrasts where surreal splashes of color and a sense of purpose seem to coexist with endless traffic jams and harsh air pollution that can make it hurt just to breathe. Located slightly east of the centre of Mongolia on the Tuul River, the capital is nested in a valley at the foot of the mountain Bogd Khan Uul which separates the steppe zone to the south from the forest-steppe zone to the north. The name, “Ulaanbaatar,” literally means “Red Hero,” in honor of Sukhbaatar, the hero of the 1921 Revolution credited with pushing the Chinese out of Mongolia. His statue sits in the center of the city’s main square. The 70-year Soviet interlude that followed the Chinese departure still marks the city as well. The central district is characterized by Soviet 1940s and 1950s-style architecture interspersed with modern high-rises and lots of construction. Beyond the center are the residential concrete towerblocks and large “ger” districts (a “ger” is the Mongolian form of “yurt,” and these round structures are the traditional homes of Mongolian nomads). Once a relatively small city, “UB” has seen its population explode since the country transitioned to a market economy in 1990. The collapse of the collective system, combined with the effects of climate change and desertification in the countryside pushed an ever increasing number of people to leave the rural areas in search of economic stability. The veneer of prosperity in UB was like a magnet. Over half of the country’s population now lives here in the capital, and the “ger towns” keep expanding along the outskirts. Yet despite the urban crowding, the locals seem to have retained a sense of that traditional Mongolian hospitality, welcoming foreign guests with a refreshing openness and willingness to share their stories over a few beers or some Chinggis Gold (a favorite brand of Mongolian vodka). Though we were only in UB long enough to meet and stage the expedition down into the Gobi, the city offered an introduction to the intriguing vibe of modern Mongolia. The blend of urban edge and deep historical roots was already apparent, and would become a repeating motif during our journey. 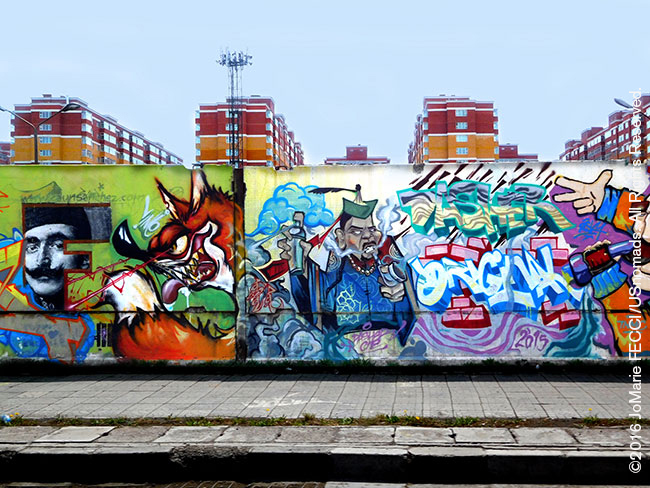 Graffiti art covered cement walls around towering housing projects that looked like they could be anywhere, while a few blocks away, a traditional Tsam performance was unique to Mongolia. 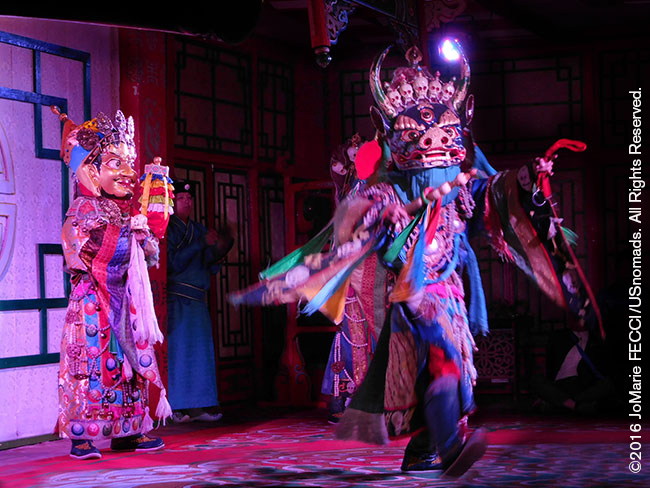 “Tsam” means “masked dance” and local variations were also practiced in Tibet and Nepal. The Mongolian version of the ritual combines tantric and much older shamanistic traditions of dance in a highly stylized fashion. The ceremony had largely disappeared during Mongolia’s 70-year Soviet period, but has been revived since the regime change of the 1990s. Much is still in flux here, as the nation’s transition from the old communist system to the current western-style democracy was not without bumps. Mongolia’s communist period, 1924-1992, has left traces — some good, some bad — on the national psyche. Their history as a relatively small population in a vast land between two powerful neighbors remains very much top of mind. Thoughtful Mongolians parse the space between the excesses and brutality of the soviet regime and the advances in literacy, health and education their nation achieved. The economic boom that followed the regime change has slowed a bit, but freedom has definitely led to a resurgence of tradition and a new cultural vibrance. In fact, our team’s presence here is peripherally related to the revival of traditional ways. 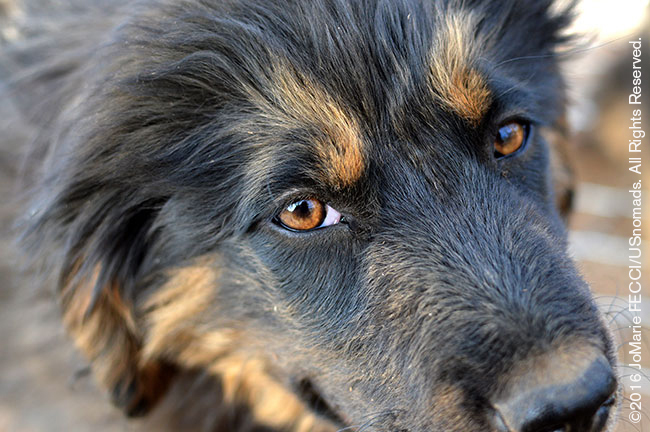 The NGO we are supporting, the Mongolian Bankhar Dog Project (MBDP) works with nomadic herders to bring back the Bankhar, a native dog breed that had dwindled under communism. Bankhars are “livestock guardian” dogs, specifically well-adapted to the harsh conditions in Mongolia, and have a long history of working side-by-side with nomads to protect their animals from predators. Elfström created the MBDP as a 501(c)3 non-profit organization to research, breed, and train Bankhars to work with nomads as livestock protection dogs. The working dogs are then placed in homes of nomadic herding families on the Mongolian steppe, where the Bankhar perform their traditional role of protecting sheep, goats, horses, camels and yak against predators including snow leopards, wolves, brown bears, foxes and eagles. 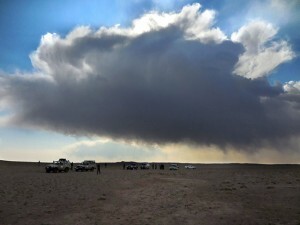 The project offers a local solution to a local problem, while at the same time encouraging sustainable practices, protecting the region’s endangered species and decreasing the environmental pressures of desertification. The MBDP now has a full breeding, training and placement program on the outskirts of UB. The first litter of Bankhar pups was born in December, 2014, and placement began in April 2015. Our group will be heading into the Gobi desert with Elfström and the MDBP operational lead, Doug Lally, to assist with the ongoing work of placement, assessments, outreach and expansion of the project into new communities. 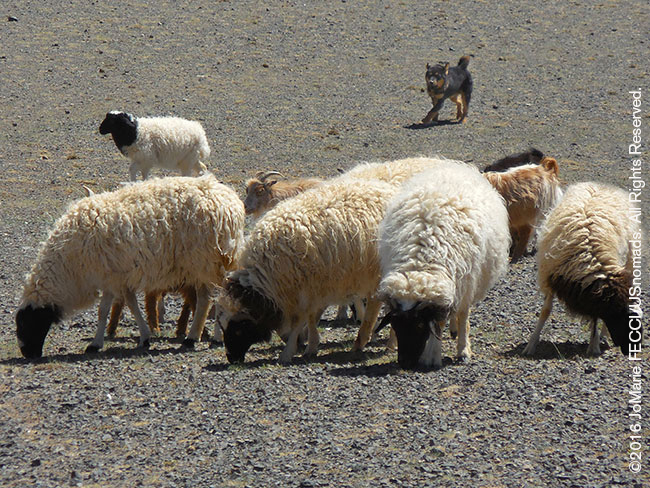 The seemingly simple solution of providing these dogs to families can make an enormous difference — herders can lose up to 85% of their flock per season to predators. With the support of properly trained Bankhar dogs, that predation number comes down to almost zero. The “main” touristic sites in the capital include the Gandan Monastery a Tibetan-style Buddhist monastery that has been restored and revitalized since 1990. It currently has over 150 monks in residence and a giant (26.5-meter-high) Budhha statue at its center. The socialist monument complex at Zaisan Memorial, in the southern part of the city, that honors Soviet soldiers killed in World War II. The memorial features a circular painting depicting scenes of friendship between the people of the USSR and Mongolia, and offers a great view over the city. There are also some great museums, notably the Winter Palace of the Bogd Khan which is on the way to Zaisan. 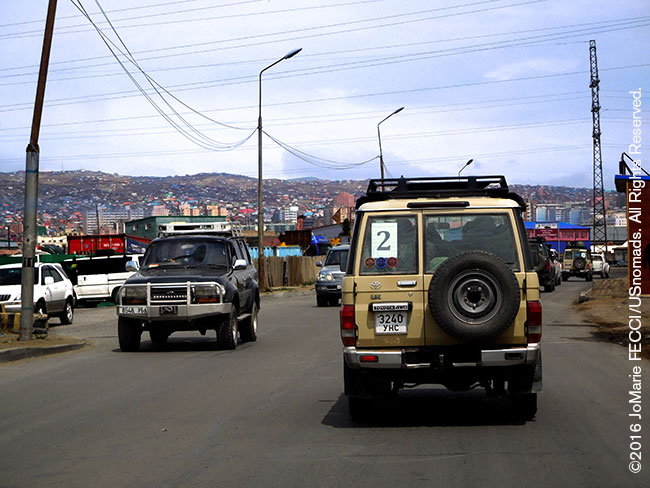 Ulaanbaatar has a comfortable summer average temperature of 72°F (22°C). But with an elevation of 4,430 feet (1,350 meters) and an inland location far from any coast, winters can be brutally cold with overnight temperatures that go down to -15°F (-26°C). In fact, due to the effects of the Siberian anticyclone, Ulaanbaatar is the coldest national capital in the world. Most of the annual precipitation of 10.5 inches (267 millimetres) falls between June to September. June and July are mostly dry, with some thunderstorms. Late August sees cooler temperatures and more rain. Spring can be extremely variable with average highs around 64°F (18°C) and lows around 33°F (1°C). 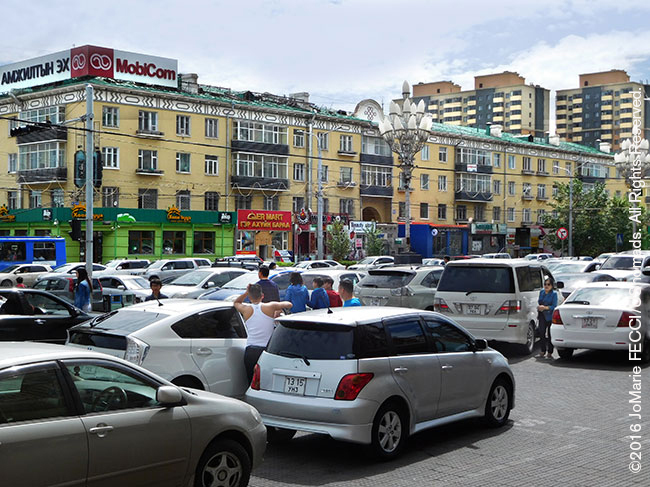 Visitors planning independent travel will have no trouble obtaining supplies in UB with plenty of shopping at the State Department Store and in the surrounding area, as well as at the Narantuul “Black Market.” And it is easy enough to resupply en route at major towns. Currency exchange is simple and straightforward at UB banks and ATMs, which are also available in main towns. Both gasoline and diesel fuel are available in towns throughout the country and most travel distances can be planned without need to carry extra fuel. 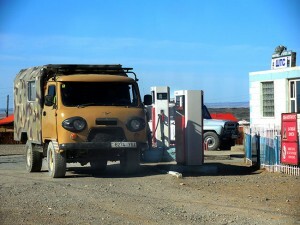 Gasoline (petrol) is called Benzene in Mongolia. 92 Octane or greater is unleaded though some smaller towns may only have 80 Octane leaded fuel. The Diesel pump is always marked with the Russian Cyrillic D sign (Д). Note, also, that it is rare to find a fueling station that has air, so it is a good idea to carry a portable compressor. 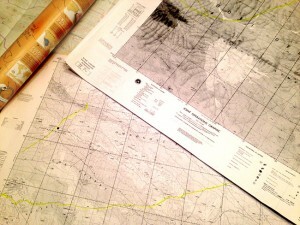 NOTE: This is the first in a series of segments highlighting locations and details of the OEX 2016 Mongolia Expedition. All text and photos are copyright JoMarie Fecci/USnomads unless otherwise noted. If you would like to use any of the imagery included here, please contact us for permission.